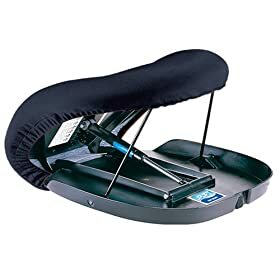 I saw something called the Seat Assist while walking by a medical supply store in San Francisco a few months ago, and it really got my brain up in a tizzy. While I know the people behind the product (and a wide array of products like it) are only looking to help reduce the suffering of people with chronic weakness and/or pain of the hips, this is simply not the best, most sensible way to approach the problem. It breeds dependence on this device — a very quick solution to be sure — when there are ways you could help train people back into independence and mobility. It’s a perfect illustration of the backwards way current medical protocols deal with musculoskeletal issues. They treat your body like it can’t possibly get any better, but everyone knows intuitively that this isn’t true. We are expected to believe that your body can only get weaker as you age — that by the time you’re 40, any weaknesses and associated aches and pains you may have are yours to keep and that there’s just not a thing anyone can do for you besides give you some pills for the pain and some more pills to help treat the sense of despair and depression that builds as you come to grips with your weaknesses. “It’s just part of aging” is the refrain heard day-in and day-out, and the age at which it gets used these days is getting shockingly lower. I’ve met too many 20- and 30-somethings with aches and pains that they just chalk up to the aging process and resign themselves to. But to believe “it’s just part of aging,” you have to also believe that it’s not possible to get stronger — ever. You have to believe that once you pass that arbitrary threshold of, say, 20-years-old, you can never make any of your muscles stronger. No matter how much you run, lift weights, or even just walk, your body will only get weaker and weaker because you are getting older and getting older means getting weaker, right? But we know that’s not true. You can start training at 20 and get stronger. You can start training at 55 and still get stronger. When we deal with pain, the story’s similar, but we’re looking for something besides “stronger.” We’re looking for “better position.” We’re looking for ways to to restore balance to all the big and small muscles of your body so that your joints are positioned properly and are able to move through a full range of motion. As long as you believe it’s possible to make positive changes to your body with smart exercise, there’s no question that you can get rid of pain. I was a 20-something with a host of aches and pains that kept me sidelined from the sport that I love (hockey) and from being able to enjoy my life. With a lot of work on fixing my own body — guess what? — I’m back to playing hockey again and am loving it!